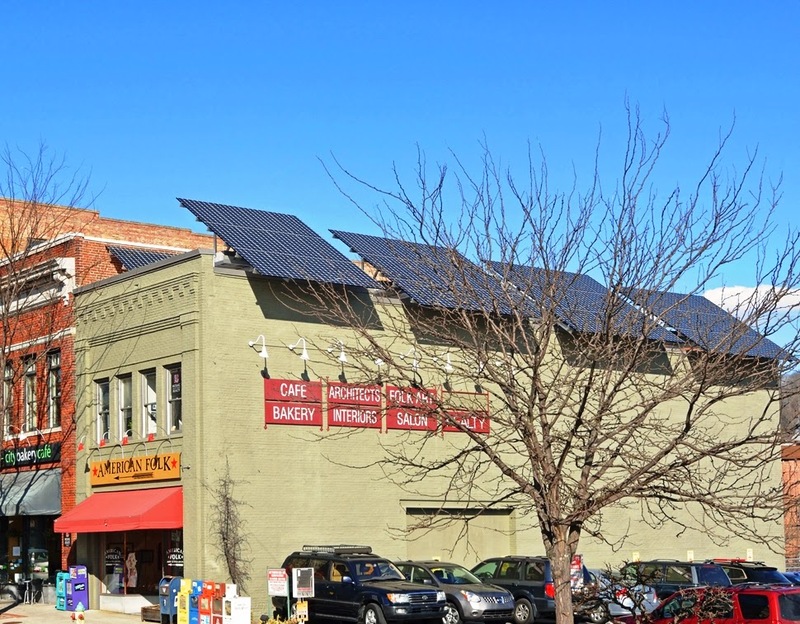 Solar Energy has received significant attention in western North Carolina lately, but nowhere is the recent solarization more strikingly visible than on Biltmore Avenue in downtown Asheville. Cantilevered off the South-facing parapet of the building that houses American Folk Art and Framing, four impressively large photovoltaic (PV) arrays are silently producing electricity. However, the statement they make is anything but mute; rather it is a strong declaration that this community embraces sustainability and innovation. A leader on the revitalization of downtown Asheville since the 1980’s when most of the buildings along this now vibrant stretch of galleries and restaurants lay derelict, Jim Samsel, AIA of Samsel Architects and Beaumont Street, LLC (property owners) is again behind the new energy that is transforming the face of Asheville. “The buildings have excellent solar access and we were keenly aware of the high visibility the project would have. The PV panels allow us to make a strong statement about our values as a business and as members of our downtown community. We hope more downtown businesses and building owners are inspired to make similar investments in solar energy,” said Samsel of the newly commissioned system. The architectural uniqueness of this solar installation by Sundance Power Systems is the result of design challenges that were posed by a roof with many obstructions and limited space. Mounting fifty-seven of the one hundred and seventeen modules that comprise the 34 kilowatt system on customized racking allowed for maximum energy production for Samsel Architects and American Folk Art & Framing. With an estimated yearly production of nearly 46 megawatts, Samsel Architect’s goal is to make the firm net-zero, meaning that they will produce an equivalent amount of electricity that they consume on an annual basis. Sophisticated on-line monitoring will allow them to track the system’s performance and measure this goal.